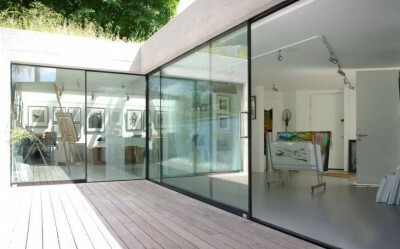 This art studio is part of a fabulous project in a house full of light, with several sets of Sightline Doors. 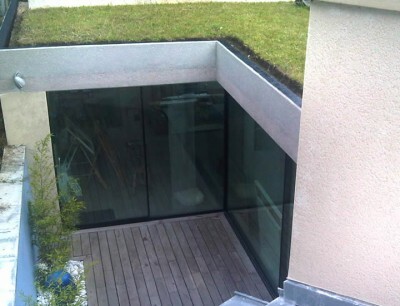 As can be seen in the photographs below, the studio is built into the lower ground, surrounded by a natural garden and with a flat, grass covered roof. The effect is stunning. 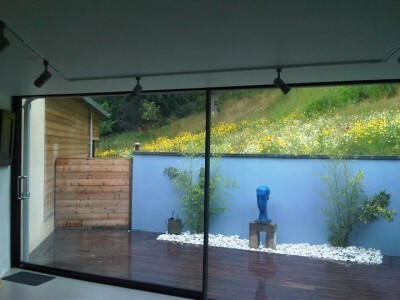 Installing Sightline doors will maximise the amount of light, open or closed, as each sliding door panel can be a manufactured up to a maximum size of six metres (approximately 20 feet) by three metres (approximately ten feet) in an aperture that may accommodate several doors, depending on the structure of the building where they are to be installed. Incredibly, the frames are only 14mm wide (little more than half an inch) and the doors glide open and closed very easily, without great effort. If you have a requirement for very large glass doors with a contemporary, minimalistic style on a domestic or a commercial building in the UK, Sightline Doors will meet your needs. Contact us to with details or call to discuss your project with us. Keep up to date – follow us on our new Facebook & Twitter accounts!